Anne's House of Dreams by L.M. Montgomery is the fifth in the Green Gables series. Anne and Gilbert finally tie the knot and leave their beloved Avonlea for Four Winds Harbour. There they find Anne's house of dreams: a little house near the sea with a brook running through the yard. As the couple settle in, they meet a new collection of kindred spirits to share their lives with. The lighthouse keeper Captain Jim has a gift for spinning yarns and fills their evenings with stories of his adventures on the sea. Miss Cornelia Bryant is a confirmed man hater who tells it like it is. And the tragically beautiful Leslie Moore, whose face has brought her nothing but heartache, reluctantly falls for Anne's charms. No matter how long it's been since I last left Anne, it's always like greeting an old friend once I open another book in this series. We always take up where we left off like it was just yesterday. Montgomery's story telling is as entertaining as ever. She creates an eccentric cast of characters who colour every page. The series still has it's down home humour but it has a somber note as well. Anne is an adult now, her problems are much bigger than the small tragedies of her childhood. One episode is especially heartbreaking and affects her deeply. Although it was sad, it was honest and helps to develop her into a character beyond that little freckled girl. Leslie's story also brings more life lessons for Anne. Not everything is black or white and 'the right thing' is sometimes a matter of opinion. Montgomery adds her flare for the sentimental in Anne's House of Dreams. Maybe it doesn't translate so well to this modern era. When Anne and Gilbert marry, birds suddenly appear (cue The Carpenters). It made me chuckle. Montgomery's prose tends to be a bit purple. Still, it didn't take away from my reading enjoyment. She writes to entertain and succeeds in House of Dreams. This is one of my favorites (so far) in the series. I read this for the 2nd Canadian Reading Challenge. 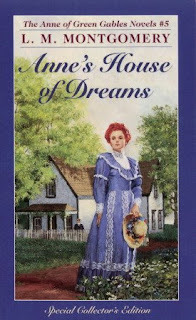 Read Anne's House of Dreams for free on girlebooks. I loved this series when I read it in its entirety... Man, I was probably just barely a teenager when I read all of them! I keep looking at them and wanting to reread them, but something else always catches my attention! Thanks for reminding me that I need to continue with this series. I loved the first three, and judging by your review I really think I'll love this too. I especially like what you said about character development and not seeing things in black and white. I love Anne's House of Dreams! I always picture the actress who played Anne in the movie while I'm reading the book. I love Anne's House of Dreams. I've always thought that it was one of LMMs strongest books in the series. Every time I read a review at different blogs of one of the diffferent Anne books I think 'Oh right, that's my favorite book in the series!" They are all so good, each in very different ways. Captain Jim, and Leslie, and Cornelia - all terrific new characters. I have not read this in a long time, but I remember enjoying it. I think my favorite will always be the first book, because I love the young, unpredictable Anne. But how beautifully she matures into a graceful woman! Kailana- I can't believe it took me this long to get to them. Nymeth- I think you'll like it. Alyce- Meghan Follows. I've seen her in a few things lately. Daibhin- I really think so too. Raidergirl- It's seems like it is so far. Kim L- She really does.